We know roughly the size and scope of the coming default wave because we know the history of the U.S. corporate debt market. 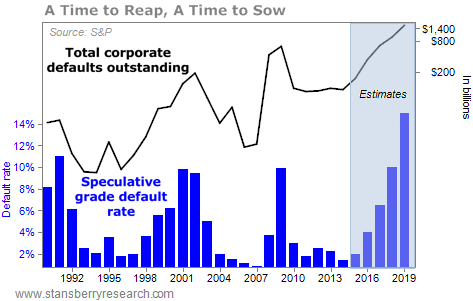 As the sizes of corporate bond deals have grown over time, each wave of defaults has led to bigger and bigger defaults. Default rates on "speculative" bonds are normally less than 5%. That means less than 5% of noninvestment-grade, U.S. corporate debt defaults in a year. But when the rate breaks above that threshold, it goes through a three- to four-year period of rising, peaking, and then normalizing defaults. This is the normal credit cycle. It's part of a healthy capitalistic economy, where entrepreneurs have access to capital and frequently go bankrupt. The most recent cycle is the one you're most familiar with – the mortgage crisis. Over the last six years, this "victory" against bankruptcy and the credit cycle has led many government leaders and their economic apologists (like Paul Krugman) to declare victory. What they won't admit is that the lack of a debt-clearing cycle has resulted in a weak recovery, and an economy that's still heavily burdened by unsustainable debts. What happens next should be obvious to everyone: The big debt-clearing cycle that was "paused" in 2009 will make the next debt-clearing cycle much, much larger – by far the biggest we've ever seen. When will that happen? Six years after default rates last returned to normal. In other words... right now. Over the last year, HYG is down about 9%. A negative return is unusual for the corporate-bond market, especially when there isn't a recession. So far this year, nearly 300 U.S. corporations have seen their bonds downgraded. That's the most downgrades per year since the financial crisis of 2008-2009. The year isn't over yet. Neither are the downgrades. 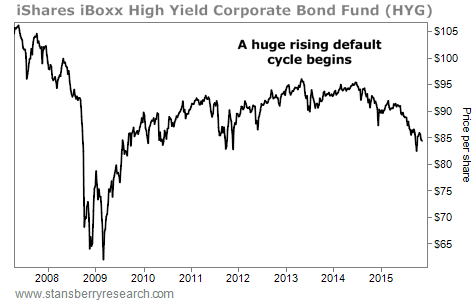 More worrisome, the 12-month default rate on high-yield corporate debt has doubled this year. This suggests we are well into the next major debt-default cycle. And it will almost surely be a "super" cycle – meaning it will last longer and cause far more losses than most people expect. Here's another way to time the next debt-clearing cycle. Now, before you panic... here's an idea you'll see us repeat again and again over the next three to four years. What's happening – rising default rates, rising interest rates on corporate debt, and falling stock prices – doesn't need to be a crisis for you, personally. You don't need to think of this coming crisis as the "end." Instead, think of what's happening as a badly needed reckoning. It's simply a housecleaning. Nothing much will change. The best assets and best businesses will still be here after the storm. The only real difference will be who owns them. What's coming is the greatest transfer of wealth in history. Over the next few years, trillions of dollars' worth of businesses, land, resources, and intellectual property are going to exchange hands – legally, but unwillingly. Investors who have been frugal and cautious will be rewarded. Investors who have been greedy and foolish will be punished.